Jonathan Switcher (Andrew McCarthy) is a bit of a loser. A sculptor, he’s not found a way to make a living, and keeps getting fired from all manner of jobs, to the chagrin of his professional woman girlfriend, Roxie (Carole Davis). Then he saves the life of a CEO, Claire Timkin (Estelle Getty) and ends up working in a department store. But when he comes across a mannequin that he created in his previous job, his life takes a magical turn. I reckon it still totally holds up. McCarthy is fun, Kim Cattrall is fun and then there is James Spader. Anytime, I will watch James Spader doing almost anything anytime. I also wonder if the character of Hollywood (played by Meshach Taylor) is the first light-hearted representation of a gay man in a Hollywood film which is generally respectful, and the only negative aspects reflect poorly on the bigots. Or perhaps there have been many more. Who knows. 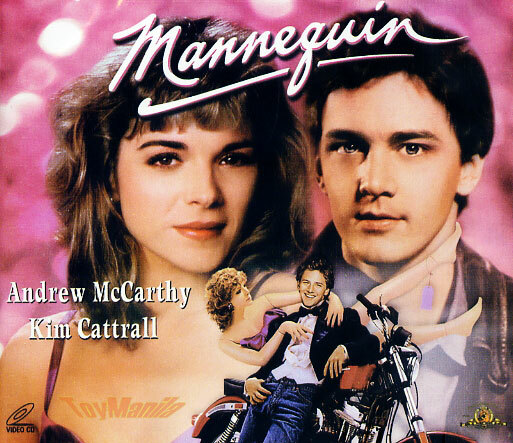 Mannequin was nominated for an Oscar for Best Music, Original Song for “Nothing’s Going to Stop Us Now”.